In the mid-60s, advanced collector and sometimes-dealer Frank Nagy published one of the first collecting magazines, Sport Hobbyist. It fit the mold of today's Old Cardboard and Net54 Baseball message boards, printing research articles, describing unusual finds, and connecting vintage collectors. Frank also printed several oddball sets and his "Famous Card Series" might be the first to specifically reprint existing baseball cards for collectors. Most Sport Hobbyist cards depict players active before WWII, an era largely out-of-reach to modern set builders. 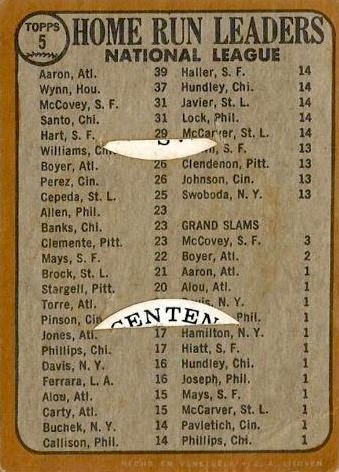 The "Famous Cards" checklist goes a step further by replicating actual cards released many years earlier, including this 1916 Sporting News (a.k.a. M101-5) Jack Barry. 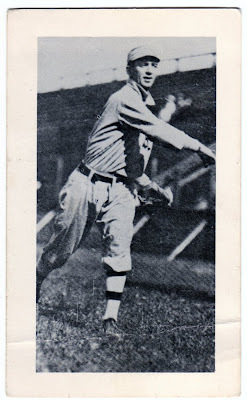 This Hobbyist type card shows Jack Barry's picture with no frame or text, possibly to avoid confusion with an authentic example from 1916. 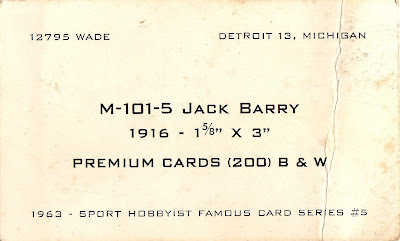 Most "Famous Cards" measure larger than the originals; compare this scan with Jack Barry as M101-5 #11. I believe the Hobbyist printed 6 cards per year from 1963 to 1967, for a complete set of 30, and probably sent (or sold) them to subscribers. (A back scan of #7 from SCD's annual price guide is dated 1964, so the first "series" ends at #5 or #6.) Their full set also includes several E-series candy cards, a handful of the rarely-seen Tango Eggs, and the first known reprint of T206's Wagner. Just for fun, I searched Google Maps for 12795 Wade St in Detroit, but didn't find anything more inspiring than a locksmith. Anyone out there know more about the Sport Hobbyist's fate? Value: Vintage reprint sets vary in demand and price, but you might find singles for under $5 and the whole set for $100-150. Fakes / reprints: It's already a low-value reprint, so I doubt anyone went to the further trouble of counterfeiting them. A while back, I broke down the 1950-70s Venezuelan sets that started as Topps partnerships and evolved into local knockoffs of American issues (full list of set profiles). 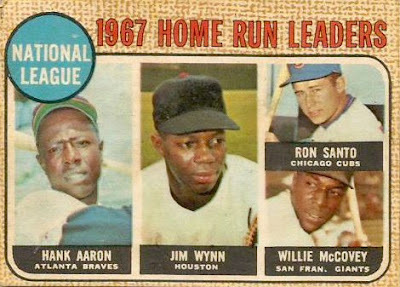 After years of hunting, my collection includes all those 1959-77 types except this white whale, a 1968 league leaders card starring 3 HOFers and the Toy Cannon in a black hat. Jim Wynn's airbrushed portrait encapsulates multiple elements of the 1968 zeitgeist. First, Topps ran into union issues with the new MLBPA, denying access to new uniform photos usually taken in spring training. On the other side of the boardroom table, the revenue heyday of America's Space Race purportedly led the owner of the Astros to ask too high a price for his franchise name and logos. Those business snafus wouldn't have made sense to candy store collectors, so Topps did their best to retouch old pictures and went with "Houston" for a couple of years. All four photos on this #5, in fact, are cropped from earlier 60s Topps sets. 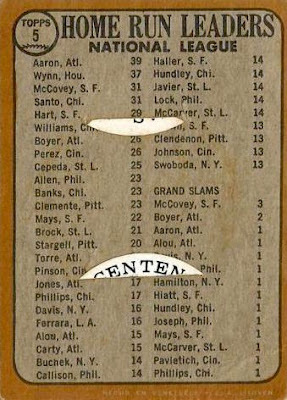 The white Spanish footer text identifies this as printed in Venezuela and those familiar with 1968 backs can tell the set uses darker yellow ink than American cards. "Hecho en Venezuela, C.A. Litoven" is courtesy of the Caracas-based publisher that printed these cards. All Venezuelan-made sets are much rarer than real Topps, but some still turn up in large lots of 1960s vintage. I've found a half-dozen singles in low-grade show boxes over the last decade and you can generally flip quickly through backs looking for the darker ink. Value: An eBay seller listed this for over $300, hoping to net a big fish. I'd probably buy one for $50 or under. Fakes / reprints: This whole set is sort of a reprint and can be mistaken as American-made. It's more important not to overpay for real Topps as if they were Venezuelan.